Tommaso Campanella OP (Italian: [tomˈmazo kampaˈnɛlla]; 5 September 1568 – 21 May 1639), baptized Giovanni Domenico Campanella, was a Dominican friar, Italian philosopher, theologian, astrologer, and poet. Born in Stignano (in the county of Stilo) in the province of Reggio di Calabria in Calabria, southern Italy, Campanella was a child prodigy. 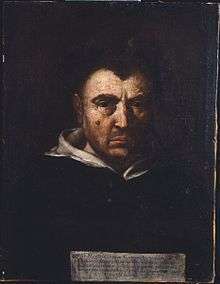 Son of a poor and illiterate cobbler, he entered the Dominican Order before the age of fourteen, taking the name of fra' Tommaso in honour of Thomas Aquinas. He studied theology and philosophy with several masters. Early on, he became disenchanted with the Aristotelian orthodoxy and attracted by the empiricism of Bernardino Telesio (1509–1588), who taught that knowledge is sensation and that all things in nature possess sensation. 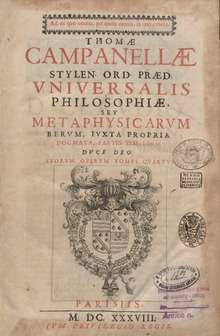 Campanella wrote his first work, Philosophia sensibus demonstrata ("Philosophy demonstrated by the senses"), published in 1592, in defence of Telesio. In 1590 he was in Naples where he was initiated in astrology; astrological speculations would become a constant feature in his writings. Campanella's heterodox views, especially his opposition to the authority of Aristotle, brought him into conflict with the ecclesiastical authorities. Denounced to the Inquisition, he was arrested in Padua in 1594 and cited before the Holy Office in Rome, he was confined in a convent until 1597. After his liberation, Campanella returned to Calabria, where he was accused of leading a conspiracy against the Spanish rule in his hometown of Stilo. Campanella's aim was to establish a society based on the community of goods and wives, for on the basis of the prophecies of Joachim of Fiore and his own astrological observations, he foresaw the advent of the Age of the Spirit in the year 1600. Betrayed by two of his fellow conspirators, he was captured and incarcerated in Naples, where he was tortured on the rack. He made a full confession and would have been put to death if he had not feigned madness and set his cell on fire. He was tortured further (a total of seven times) and then, crippled and ill, was sentenced to life imprisonment. Campanella spent twenty-seven years imprisoned in Naples, in various fortresses. During his detention, he wrote his most important works: The Monarchy of Spain (1600), Political Aphorisms (1601), Atheismus triumphatus (Atheism Conquered, 1605–1607), Quod reminiscetur (1606? ), Metaphysica (1609–1623), Theologia (1613–1624), and his most famous work, The City of the Sun (originally written in Italian in 1602; published in Latin in Frankfurt (1623) and later in Paris (1638). I felt great disgust upon understanding that theologians of the Congregation are to prohibit the Dialogues of your truly, and no person will be (in that council) who knows mathematics, or about recondite things. Be warned that while yours truly does state the thoroughly-forbidden opinion of the motion of the earth, you are not obliged to believe the reasons of those who contradict you. This rule is theological, and the validity is like that of the second Council of Nicaea which decreed that Angelorum imagines depingi debent, quam‘am vere corporei sunt (Images of angels must be depicted as they are in the flesh): while this decree is valid, the reason is not, since all scholars in our day accept that angels are incorporeal. There are other very reasons. I doubt violence to people who do not know. 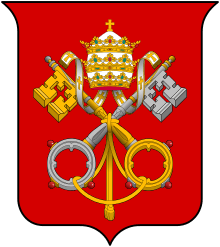 The present Pope likely has not made his mind in this case...but for my part, I will write and warn the Grand Duke of Tuscany, that if they put Dominicans, Jesuits, Theatines, and secular priests against your books in this council, they should also admit the Father Castelli and me. Campanella was finally released from his prison in 1626, through Pope Urban VIII, who personally interceded on his behalf with Philip IV of Spain. Taken to Rome and held for a time by the Holy Office, Campanella was restored to full liberty in 1629. He lived for five years in Rome, where he was Urban's advisor in astrological matters. In 1634, however, a new conspiracy in Calabria, led by one of his followers, threatened fresh troubles. With the aid of Cardinal Barberini and the French Ambassador de Noailles, he fled to France, where he was received at the court of Louis XIII with marked favour. Protected by Cardinal Richelieu and granted a liberal pension by the king, he spent the rest of his days in the convent of Saint-Honoré in Paris. His last work was a poem celebrating the birth of the future Louis XIV (Ecloga in portentosam Delphini nativitatem). ↑ Apologia pro Galileo, Published in Latin by Impensis Godefridi Tampachii, Typis Erasmi Kemfferi in Frankfort, Germany. ↑ Memorie y lettera inedita di Galileo Galilei, Second part, published in Modena, 1821, page 144. Il Padre Tommaso Campanella al Galileo. (Libreria Nelli) Roma 25 Settembre 1632. Con gran disgusto mio ho sentito che si fa Congregazione di Teologi irati, a proibire i Dialoghi di V. S.; e non ci entra persona. che sappia matematica, nè cose recondite. Avverta che mentre V.S. asserisce che fu ben proibita l’opinione del moto della terra, non è obbligata a creder che anche e ragioni de’ contraddicenti sien buone. Questa è regola teologica; e si prova perchè nel Concilio Niceno secondo fu decretato che Angelorum imagines depingi debent, quom‘am vere corporei sunt: il decreto è valido, e non la ragione; giacchè tutti i scolastici dicono che gli Angeli sono incorporei a tempo nostro. Ci son altri fondamenti assai. Dubito di violenza di gente che non sa. Il Padre Nostro fa fracassi contra, e dice ex ora Papa: ma tu non è informato, nè può pensare a questo. V. S. per mio‘ avviso faccia scriver dal Gran Duca, che siccome mettono Domenicani e Gesuiti e Teatini e Preti secolari in questa Congregazione contro i vostri libri, ammettano anche il Padre Castelli e me. This article incorporates text from a publication now in the public domain: Chisholm, Hugh, ed. (1911). "Campanella, Tommaso". Encyclopædia Britannica. 5 (11th ed.). Cambridge University Press. Wikimedia Commons has media related to Tommaso Campanella. Ernst, Germana. "Tommaso Campanella". Stanford Encyclopedia of Philosophy. Peter Forshaw (2010) 'Astrology, Ritual and Revolution in the Works of Tommaso Campanella (1568-1639)'. The City of the Sun; A Poetical Dialogue between a Grandmaster of the Knights Hospitallers and a Genoese Sea-Captain, his guest. Translated to English by editor Henry Morley, Project Gutenberg. Ideal Commonwealths; Contains excerpts from City of the Sun and short biography, by Editor: Henry Morley, Professor of English Literature at University College, London; Fifth Edition, 1890, Project Gutenberg. Sonnets of Michelangelo Buonarrotti and Tommaso Campanella, 1878; translated into Rhymed English, by John Addington Symonds, author of Renaissance in Italy.